In the universe (U1), super galactic GM attraction with in the solar systems and out ward galactic is a GM process of the dimension (U1) in cohesion with (U-1), (U-2) etc. The dimension (U1) is the beginning and the end. There can not be a (U+1) because of the enormous outward escalating energy and motion barrier, as calculated by the GTM. (See GTM. chart). Also, one must conserve the thought if (U1) was contracted into (U-1) with us in it, would those same energy calculations give the same results? If so one has to entertain the possibility that (U1) at some distant point resolves into (U-1) and that is food for infinity thoughts and it can serve to discuss alternatives to the course of the red shift within the universe. This again leads into a vision of a bizarre universe, which cant quite be conceived three-dimensional. If a solar system (in classic terms) is considered to act somewhat like an atom then the GM process around galaxies, can be conceived in the dimension of (U1). Lets presume in this dimension, for super GM, to make this concept understood the electrons are now the planets and the nucleus is the star or between the earth and the moon the earth acts as a nucleus. The earth is orbiting the sun Fig.13 a, arrow direction. 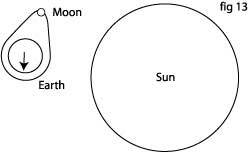 The moon orbits the earth, in an elliptic path as shown. If this is a constant repeating GM orbit, as long as the moon stays with the earth, the moon will slow the earth orbiting velocity around the sun down and the planet will draw closer to the sun. The GM of the dimensions (U-1), (U-2) are involved in this attraction process and one must consider (U-3), etc. The same goes for a solar system. If the planets are in a GM orbit around a star and the way the GM concept works, if their elliptic orbit faces against the galactic spin Fig.13 b this will cause a loss of orbital velocity. The solar system will eventually draw closer to the centre of the galaxy according to the GM (U1) by a possible super stellar GM vibration frequency. The solar system could be drawn over the top of the cartwheel shape, into the centre. That is because any GM attraction angle of a stellar body, that is not angular momentum stabilized by orbiting an other stellar body, is then drawn to ward it by the GM of (U1), in cohesion with (U-1), (U-2), (U-3) to infinity or return. If many solar systems where in such a predicament, the whole galaxy in a contraction process, could therefore change its shape into an elliptic form, some galaxies may be transferring from a cartwheel to an elliptic shape. So, I suspect, that cartwheel galaxies are younger and elliptic galaxies are older and in a contraction process. Smaller galaxies orbiting larger galaxies could experience a similar attraction, ending up to be absorbed and then to be renewed. According to the GTM, a repeat of the big bang theory can be modified; there is no need for a big bang, except to justify, todays scientific view, of the creation and there must have been a local or a universal creation, its been said, by the Highest. If you believe in Albert Einstein in length elongation and contraction, if you believe in time dilation and it is in accordance with science. Then you have to give my work at least the time of the day and consider my concept of GTM, hence the next big bang may be only a contraction, to GTM limit- lag times, a local event, involving only one or a number of the galaxies. As a result, there could be then, a stellar contraction into a developing black hole in one area and a re-emergence (reborn) an expansion in to another area. This in GM would be conceived as local twin funnel shapes inward for contraction and outward for expansion. The universe would therefore be divided in two and we are part of the expanding half. The curvature of the funnel maybe related in thought, to Einsteins space curvature. re-emerging out of the black hole situation, unfolding in a different region, intact or as a total recreation. May be the galaxies in the universe will reveal a succession of these shape - changing events. According to GM the galaxies can not be drawn into existing black holes! Because a existing black hole has, a higher main over riding frequency, from aprox.8.3x1027 HZ, this is the (U-2) GM frequency. It is not compatible, to a galaxy at a stellar main dominating GM (U-1) vibration frequency, with directional bundles of approx. 40000 HZ. By GTM two galaxies in an equal state of contraction can contract into one, forming a developing black hole within. Because a main state prevailing frequency within a mass, will attract a main state equivalent frequency hence the mass with that residing frequency within. . By GM in a difference of two dimensions, the super frequency (U1) (One calendar year) the earth orbiting around the sun, equals, "1super stellar HZ " at a duration of 3.156 x107 seconds per orbit, multiplied by 6.6x1015 HZ ( Niels Bohr Z1), equals 2.08x1023 HZ. Hence this calculated frequency is the approx. difference between (U1) and (U-1) or between (U-1) and (U-2) etc. This is considered by GM, the difference between all 'minus' dimensions separating them, the same applies to the GM vibration frequencies throughout the dimensions. The primary GM vibration frequency for (U-1) equals approx. 40000 HZ, and the primary GM frequency for (U-2) equals, to approx. 8.3x1027 HZ. These GM frequencies relate to each other, in their dimension ratios, as they can form a train of succession. The beginning, by (GM) has to synchronize to an equal frequency value to permit entry, this allows the basic contractions inter action. It should be possible to determine the (U minus) Dimension State of a black hole, by the GM frequency emitted from within a black hole. With this, one should be able to determine if a black hole is in a contraction or an expansion process. For example, for (U-1) the GM frequency is 40000 HZ and the Z 1, dimension frequency is 6.6x1015 HZ. For (U-2) the proportional GM frequency is 8.3x1027 Hz or the proportional Z 1 dimension frequency is (6.6x1015 x 2.08x1023) = 374652356x1038 HZ. A black hole in a contraction or expansion progression, within these dimensions, should be within those frequencies. If the black hole was in a contraction state of (U-3) or a lower dimension, the frequencies should be within the ratio of these dimensions. For detail refer to the (U1) dimension chart. These frequency calculations, have been based on Bohrs Z1, 6.6 x10 15 electron orbits per second and the GM frequencies calculated from the base of 40000 HZ a multiple of 2.08x1023 throughout the minus dimensions and are presumed to be (GM) vibrations. If this data should be used, to estimate from a base frequency of heavier atoms the calculations have to be modified accordingly. A thought about the red shift in this scenario, if elliptic galaxies we see are either contracting or expanding, then one half of every galaxy is basically moving away from us in every direction. The same applies for cartwheel galaxies for the arm that spins away from us, if the galaxy is side on toward us. Here is an interesting point, the outer part of the galaxy arms should have a greater velocity, in respect to the observer, due to their angular momentum, than the one closer to the centre therefore a difference in the red shift should be noticed. If you ever gave it some thought, how mass attraction over stellar distances functions, especially if you try to picture it to inter galactic distances, than by Newtons inverse square law you couldnt quite visualize this in contemporary stellar science, as mass attracts mass by gravity, period. By the same approach if you wanted to explain why in solar systems angular momentum velocity around galaxies, does not add up to the conventional center attraction laws calculations! This is, to understand it by relativity, space curvature or Newtonian mechanics! With this GM concept you have mechanics, of proportional to the size of mass regulated, self-adjusting forces, that work from within mass. Thereby responding gravitational to electromagnetic frequencies, proportional in respect to their origin to the distance and volume of that mass. Graviton messages signals that bridge the universe from one end to an other, at the speed of light. Thus the mechanics of the universe are controlled by a unique GM (distance/C) response time. This is influencing the expansion rate to infinity or contraction to a crunch of the universe offering a different calculable possibility.